Hey everyone! Hope you all are doing well. My apologies for disappearing for 6 months, but now I am back after some R & R.... with lots of good food and stories. One of the most loved posts on my blog is Eggless Sour Cream Vanilla Cake. Today's Tutti Fruity cake is adapted from that. I have tried to make it healthier using Whole Wheat Flour (Indian Atta). My kiddo loves it and hope you guys like it too. Preheat the oven at 350 degrees F. Grease a loaf pan with cooking spray or oil or butter. Mix Tutti Fruity with 1 tbsp all purpose flour and set it aside. You can add some chopped nuts or dry fruits as well. Crush the cardamom seeds in a mortar pestle to a fine powder. You can use vanilla extract or cinnamon to flavor your cake, if you like. In a mixing bowl, sift the dry ingredients - 1 cup all purpose flour, atta, salt, baking powder and baking soda. Mix well with a spoon. Atta is the whole wheat flour available in Indian grocery stores. The whole wheat flour available in local super markets is not the same as Atta. 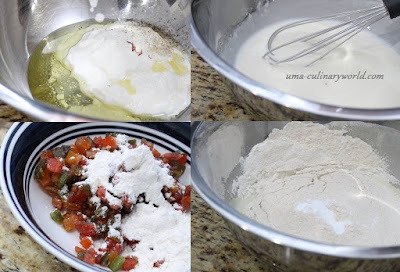 Instead of Atta, you can add 1/2 cup all purpose flour. All purpose flour cake as compared to Atta cake turns out much softer. In a big mixing bowl, add sour cream, oil, milk, sugar, cardamom powder and saffron strands. Mix well with a whisk until sugar dissolves completely. To this, add the sifted dry ingredients. Mix gently with a spatula. Do not overmix. Lastly, add the tutti fruity and stir again. Pour this cake batter in the greased loaf pan. 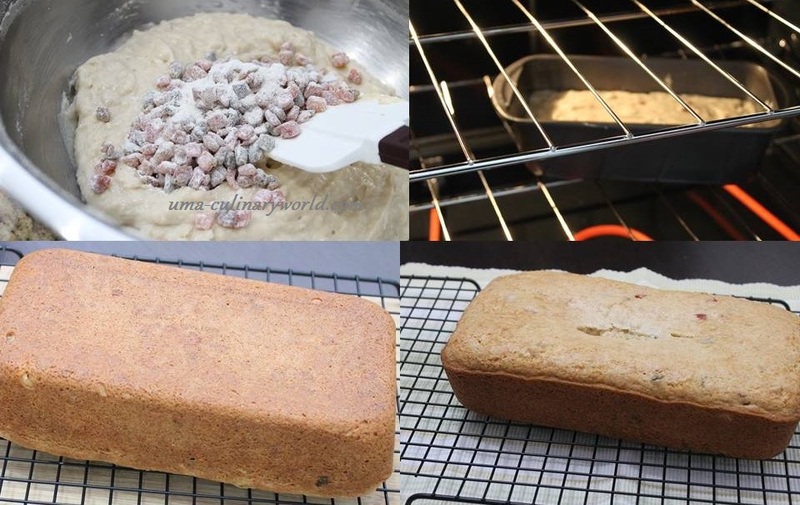 Bake the cake in the preheated oven at 350 degrees F for 30 - 40 minutes or until a toothpick inserted in the centre of the cake comes out clean. Baking time may vary depending on the oven. You can bake Eggless Tutti Fruity Muffins as well, if you like. Happy Baking! Until next time, take care. Where do you by tutti fruiti here Uma? Hey Preethi! I got it at a local Indian store in Miami. Tried this twice. It turned out to be Super hit. All in my family loved it so much that we have decided not to buy fruit cake from our favorite cake shop henceforth. Thanks you so much. That's awesome. Thank you for your feedback.